Canadian Tire is running a two day only gift card promotion. The promotion which runs on Saturday October 24 and Sunday October 25, 2009 offers consumer a $10 Canadian Tire gift card when they Spend $50 or more at any Canadian Tire location. Unfortunately there are a number of conditions on the cards, the $10 promo Canadian Tire gift card must be used before October 31st, 2009 which does not leave much time to use the promotional gift card. There are also several products and services that are not eligible for the Canadian Tire promotion, including Auto Service labor fees, Mark’s Work Warehouse merchandise, and Canadian Tire Gift Cards. KFC is giving away 200 $5 dollar KFC gift cards and 200 $10 gas gift cards to mark the beginning of the summer. The KFC $5 Fill-Up Giveaway not only provides you with enough money for lunch, but KFC will even pick up the cost of your gas. KFC’s giveaway is aimed at filling up Americans stomachs as well as their gas tanks as the summer vacation season gets underway. The promotion is on from July 2, 2009 to July 5, 2009. The contest opens on KFC’s website at a randomly determined time between 10am and 2pm ET. The first 200 people to enter during that time period will receive the KFC gift card and the gas gift card. There is a limit of one $5 KFC gift certificate and one $10 gas card per household, and those entering must be a 18+ years old resident of the United States. If you are already full you can sell your KFC gift card and gas gift card and get cash for your cards. Giftah, the webs most popular site for buying and selling gift cards online will buy your gift cards directly or you can list your cards for sale in an auction. Either way you end up with some extra money this summer you can spend wherever you want. Disney has a pretty decent gift card promotion on for a limited time. 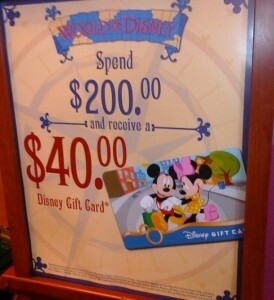 Any customer who spends $200 or more at the World of Disney store located in Downtown Disney’s Marketplace will receive a $40 Disney gift card. 20% back on a purchase is pretty good, although the minimum purchase price is fairly large. However, considering the sky high prices in Downtown Disney stores it should not be too difficult to spend $200+ dollars on some stuffed animals. If you want to get back some of the massive amounts of cash you drop in Downtown Disney you can always sell the gift card on Giftah, the webs premiere gift card marketplace. You can list your card in an auction style sale or sell it directly to Giftah. Either way you recoup a good amount of cash for your unwanted gift cards. GameStop and Atari’s Backyard Baseball are hosting a competition this summer to find GamesStop’s Backyard Baseball Kid of the Year. Anyone can enter on GameStop’s website (click here) before August 16th to be eligible to win. The contest is open to any legal residents of the United States who are 6 years or older. There are some great prizes available, first place takes home two $1,000 GameStop gift cards and a official MLB baseball autographed by David “Big Papi” Ortiz. There are also 100 additional $30 GameStop gift cards available and 500 trial subscriptions to Baseball Youth Magazine. The GameStop gift card are obviously the major win in this competition, scoring $1,000 for GameStop could easily net you several of the newer consoles and some games to boot. If you’re not a gamer the contest still could be worth the time it takes to fill out your entry. You can always unload any GameStop gift cards you win for cold hard cash. Giftah the online gift card marketplace lets you sell gift cards for cash. 1) 12 x 473/591ml bottles of Nestea, Nestea Cool, or Nestea Vitao and receive a $25 prepaid Mastercard gift card. 2) 10 x 10 (200ml) tetra packs of Nestea and receive a $25 prepaid Mastercard gift card. 3) 10 x 2 bottles of Nestea Cool and receive a $25 prepaid Mastercard gift card. 5) 4 x 12 (341ml) can packs of Nestea, Nestea Cool, or Nestea Vitao. The proof of purchases will be available on specially marked Nestea products until the all the packages are sold or August 31, 2009. After purchasing the products the proof of purchase and receipts must be mailed in to Nestea. Each household is limited to claiming 3 $25 prepaid Mastercard gift cards. For the full details of this promotion check out Nestea’s Refresh and Redeem website.